As noted on the previous page, elements are the building blocks of your site. All of your content (aside from a few exceptions like the header image, which we’ll cover later) is added via an element. Let’s explore some of these elements and add them to the first page of our example site. 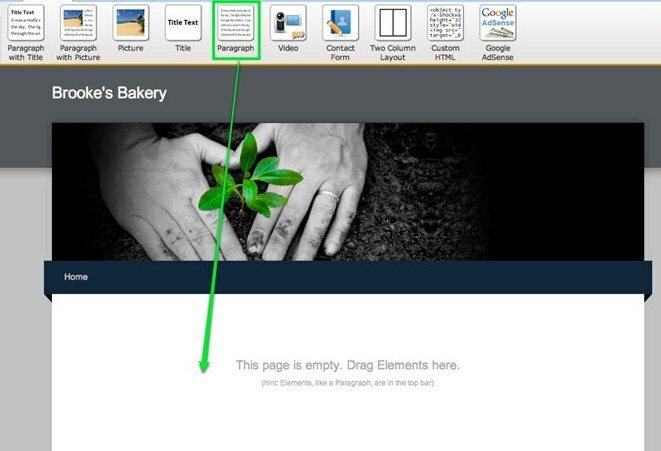 Adding an element to a site is as simple as clicking on that element and dragging it to the content area of a page. Let's drag the most basic element -- the paragraph element -- to this sample site. The paragraph element is exactly what it sounds like -- an element for writing text. You can write a word, a sentence or multiple paragraphs in a single element. Just click within the element to start editing. As you write your text, take notice of the blue toolbar at the top of the editor. Every element has its own toolbar with functions specific to that element. The text toolbar enables you to (from left to right) Bold, Italicize, Underline, change the color, increase the size and decrease the size of selected text. You can also create a link to another site, a page within your own site, an email address or an uploaded file. Beyond that you can align all the text in an element to the left, center or right, create both bulleted lists and numbered lists, and also undo / redo changes. Each of these elements use the same text editing toolbar we looked at above and you can stack as many of them as you want on a page.